DAYTONA BEACH, Fla. -- Seven-time NASCAR Winston Cup champion Dale Earnhardt, 49, was fatally injured Sunday in a multi-car accident on the final lap of the 43rd Daytona 500 at Daytona International Speedway. The announcement was made at 7 p.m. ET by NASCAR President Mike Helton. "NASCAR has lost its greatest driver," said NASCAR Chairman of the Board Bill France, who himself is recovering from life threatening illnesses, "and I personally have lost a great friend." 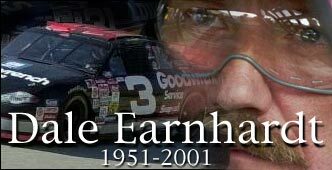 I want to express my sincere condolences to Teresa, Dale Jr. and the rest of the Earnhardt family. I can only imagine the pain and sorrow you must be feeling, as I am having a very hard time with it myself. Dale was loved and respected by me and millions of others. I really wanted to tell him that in person, but the opportunity never arose, so I'll do it now. I really enjoyed watchin you thru the years, Dale. I've been rootin for ya since I first saw you race and give Petty a run for his money. I eagerly anticipated every Sunday and wore that 3 hat every day, just in case I could bring you a little luck. I will always remember that fast ride you gave Terry Bradshaw and the fun and excitement you brought into my sometimes dull life. Sure did want to see you win number 8 this year. Thanks for all that great drivin and the hardships you went thru to do it for us. I'll be missin ya every day.